Churches define themselves both by whom they include and exclude. There are some indications that aspects of religious modernity find diversity and difference difficult to embrace. Attitudes to age and race are examples of this. Anthony Reddie is a refreshing and challenging voice in these debates. He has researched the Christian Education of Black children in Birmingham and now turns his attention to the contributions of Black elders who have struggled to find a voice and keep faith with their roots and traditions. The stories of these elders are represented here in a way that demonstrates how their identity is affirmed and their values passed on to a younger generation. Reddie shows how the texture of theology is improved through a careful, systematic openness to others. Reflected in this book are many voices of individuals from 26 inner city churches in Birmingham. It reveals how older members, often grandparents, are the bedrock of so much of Black family life here in twenty-first century Britain. The book challenges us to remember how easily we forget the presence, contributions and achievements of Black elders in British society and churches. It also emphasises the importance of the oral tradition of telling stories as a way of strengthening and encouraging younger people. This nurture of children and the integration of older people can take place through intergenerational conversations. This is a way available to us for the enriching of each other's lives through mutual encouragement and for the deepening of a shared identity of faith. Reddie achieves this through the use of three broad approaches. 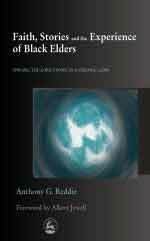 He first establishes the historical and theological background of the oral traditions of Black people. He then outlines the methodology and framework used in order to gain access to these stories of faith and experience and finally highlights some of the practical possibilities arising from the work. Although the world has changed and the church's relationship to the fragmentation of values and pluralism of cultures makes connection difficult, this book offers some hope. Dislocation and dysfunction do not prevent us from listening to and affirming older people. Accepting the ambivalence some feel about religion does not prevent an engagement in a critical and constructive dialogue about what makes for good Christian education for children and adults. In our acknowledgement of cultural diversity racism pervades and Reddie leads us to a place where we can open ourselves up to learning from difference and diversity. I hope that this contribution to pastoral theology will be read and used. Reddie has provided us with tools to embrace a different way of understanding older people and ultimately of being Church.